The first generation of Skoda Fabia was offered as a sedan, along with hatchback and wagon body style. For the second generation, which was introduced in 2007, sedan shape was not available anymore. Skoda revived Rapid name in 2011, which wasn’t in use since 1990 when fastback coupe carrying it ceased to exist. New Rapid sedan was introduced just for the Indian market, and it bore Fabia face, though it was based on a different platform shared with VW Vento, which is in this case Polo sedan, again for the Indian market and just a few others. Then finally Czechs have launched Rapid global model in 2012 in sedan and also hatchback shape named Spaceback, which basically doesn’t have anything with mentioned Indian version, and it utilized different and newer platform also. Anyway, 2017 Skoda Rapid is here, bringing some novelties, so let’s see which ones. Visual changes are more subtle and not visible instantly. Front bumper is redesigned with differently shaped fog lights, if you go for Style package you’ll get chrome lines integrated into the headlights, which is a nice touch. Upgraded headlights now offer bi-xenon, while daytime lights use LED technology. 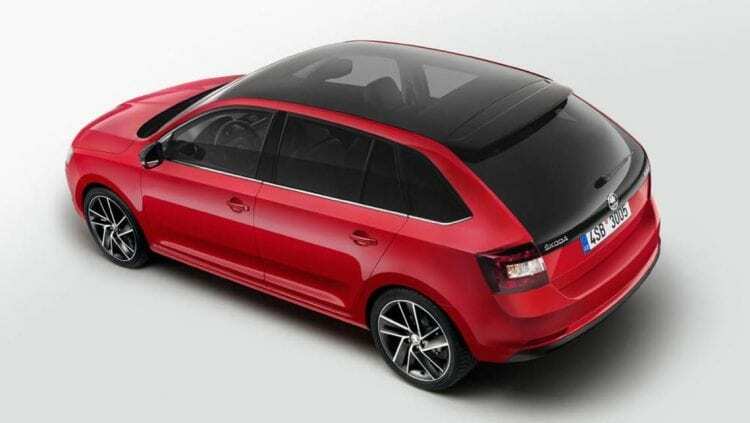 At the back, lights are tinted, and Spaceback model has bigger rear window making it more elegant when observed from that side. Add to all of that new design of 15 to 17-inch sized wheels, and we concluded exterior changes. In the interior, we have differently designed air vents, instrument gauges, and air-conditioning buttons. The cabin is still dull and unimaginative, but also continues to shine in space area and offers acceptable materials and build quality for its price bracket. But, emphasize that price part. As usual with vehicles from Skoda boot is enormous with 19.4 cu ft, while Spaceback offers less but still respective 14.6 cu ft of cargo space. We still have 1.4-liter petrol engine rated at 125 hp, along with 1.4-diesel one delivering 90 hp and 1.6-liter also diesel with 116 hp. New thing would be the disappearance of 1.2-liter I4 petrol engine which is being replaced by 1.0-liter I3 TSI unit coming with two power outputs- 95 hp and 110 hp. Both versions offer more than the ones from outgoing I4 while giving higher mpg ratings, so it is more than welcomed change. Also, new I3 uses aluminum crankcase, reducing weight by 22 pounds and on top of that, it runs more smoothly. Simply Clever is the slogan that Skoda uses, and it tries to be justified by at first glance small things, but actually highly appreciated. In that manner, you have two USB ports at the back for your kids to use, ice-scraper hidden in fuel tank cover, which you will praise if winter comes and you forgot to purchase one, a drawer for high visibility vest under the driver seat and even umbrella under the passengers seat, among other stuff. Rapid also comes well connected with Apple CarPlay, Android Auto, MirrorLink and WLAN hotspot. 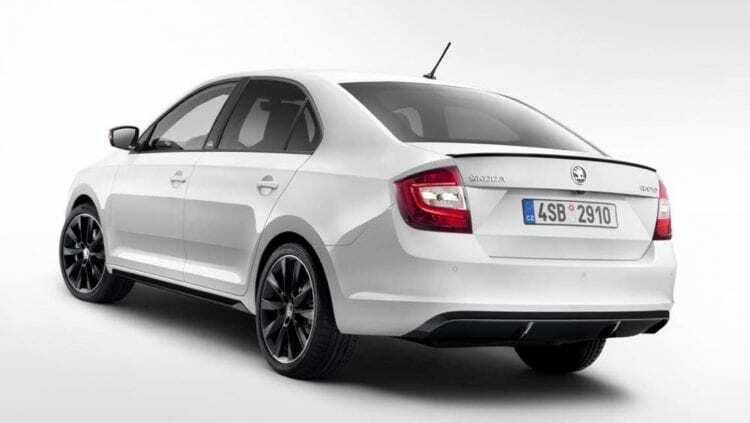 2017 Skoda Rapid HOW MUCH? That is the basic question that is asked for pretty much any Skoda model, and 2017 Skoda Rapid is no exception. This is a car that will hardly steer any emotions from anybody, but it will always be one of the reasonable choices when calculating how much you’ll get for your penny. Rapid is slotted between Fabia and Octavia, while prices start around $14k depending on the country. This is somewhat less than Octavia, leaving Rapid as the first entry to something which might act as a family transportation and actually being capable of carrying family luggage, while emotions are pushed to the side in this case.